A century has passed since the beginning of the First World War, and now only the letters from men serving in the Tsar’s army on the eastern front allow us to fully feel the terror of the men that were involved in it. Unlike in other European countries, in Russia the First World War has remained in some ways a forgotten conflict, overshadowed by the sheer effort and cost imposed upon the nation by the victory in WWII. Yet for three years Russian troops were in action against Austro-Hungarian and Prussian troops on the eastern front, suffering huge casualties before the Bolshevik Revolution ended the country’s participation in the war. With the outbreak of hostilities in 1914, Russia implemented the Provisional Regulations on Military Censorship, which allowed the government to review and seize any letters from the front if they contained any secret information. Thanks to this regulation, we can now read these letters, which are located in the archives, especially in the Russian State Military Historical Archive, where several volumes of letters from the front have been preserved. However, soon the battlefields were covered with bodies of the fallen, and their families began to receive letters of condolence. And then came the realization of the war as a personal catastrophe, and an awareness of the irreversibility of terrible events began to penetrate into the hearts of people. Other letters relate the brutality of events in unflinching detail, documenting how battles became a slaughterhouse. “We are defending a bridge,” writes one soldier. “Yesterday the Germans wanted to cross over to our side, but, after letting them come up to the middle of the bridge, we opened such hellish fire that the Germans were forced to run like mad. Piled on the bridge were literally mountains of corpses. “Today they again wanted to cross, or to remove the corpses of their men. Our artillery with its accurate fire instantly cleared the bridge of the red-faced pork-butchers. To the right of us, they wanted to cross at any cost. They rushed neck-deep into the water, but our machine gunners and riflemen did not even let them reach the middle of the river. “We were in the trenches, and repulsed the attacks of the Germans, who never came closer than 400 steps, being forced to turn back and leave. Four times they came towards our trenches (we could clearly see their faces), but could not withstand our fire and turned back. 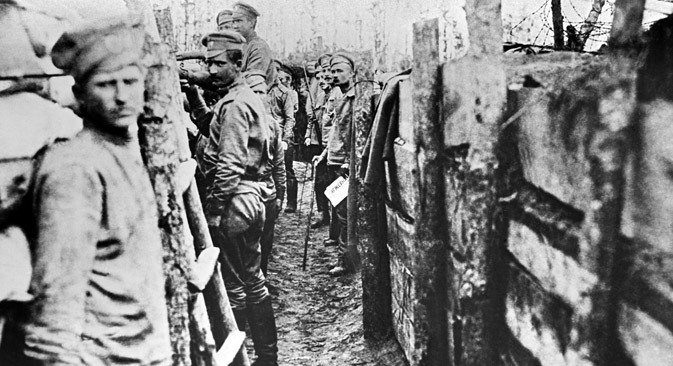 “Sazonov and I lay next to each other in the trench, shooting at their officers and selecting the bigger soldiers. Well, we dropped those damned ones! They walked in silence, without firing a shot, in a wall formation. We allowed them to come close to us, to the best shooting distance, and then opened up with a terrible barrage. There was probably nothing more horrible than a massive artillery ‘preparation’. When absolutely nothing depends on the man, he just hugs the ground, waiting for the barrage to stop, but it goes on, and on. Deprivation, blood, trench dirt, and the deaths of comrades – that is what the First World War looked like to the ordinary Russian soldier, a conflict unprecedented for humanity at beginning of the twentieth century in its scale and the number of war dead. First published in Russian in Expert.